'Performing Arts' (Keith Keppel, R. 2005). Seedling# 99-104A. TB, 36" (91 cm), Late midseason bloom. Standards pinkish orchid (M&P 43-FG-4); style arms pinkish orchid (44-D-1); falls pinkish orchid (43-G-4), paler (43-BC-2) center; beards melon (2-D-10), white at end. 'Social Graces' X 'Vienna Waltz'. Keppel 2006. From AIS Bulletin #341 April 2006 Introducing PERFORMING ARTS ML 36" (Social Graces X Vienna Waltz). 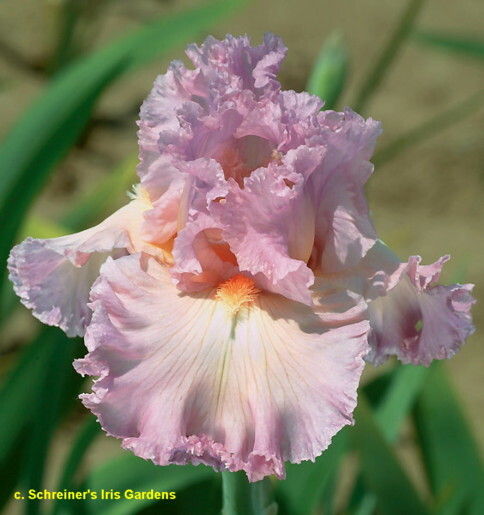 Ruffled, lightly laced pinkish orchid with creamier falls; beards white to soft melon. #99-104A. $45.00. Keith Keppel.